Google Street View currently claims this place is called Golden Age, but I am sure it was the decidedly more dodgy sounding Loving Hut when I visited today, so that is what I will call it. Whatever the name, Loving Hut is a cheerful restaurant on Victoria St West just down the hill from the Sky Town on the other side of the street. There are no sliced pigs ears here, Loving Hut is completely vegan. The atmosphere is unpretentious and relaxed, perhaps a little too relaxed since I was the only customer for the duration of my lunch. The business has a religious air, with crystals on display and colourful literature available which perhaps puts people off. It doesn't affect the food though, which is reasonably priced, speedy, and delicious. 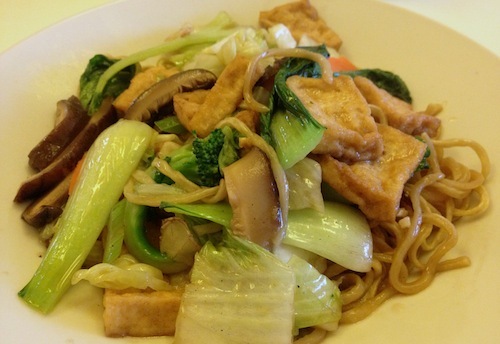 This is the Cantonese-style noodles dish with lashings of ginger, the perfect start to a crisp winter's afternoon. On a previous visit I had the curry vegetable soup which was also great.